Love jello, but wish there were more flavors in each bite? Love rainbow jello dessert but hate to make it because each layer takes forever to set? (I've been impatient before and have had flavors bleed into each other. Still yummy, but looks icky.) Well, this broken glass jello recipe is both super easy to make, and so delicious! The best part? You can change up the jello flavors/colors for any occasion! 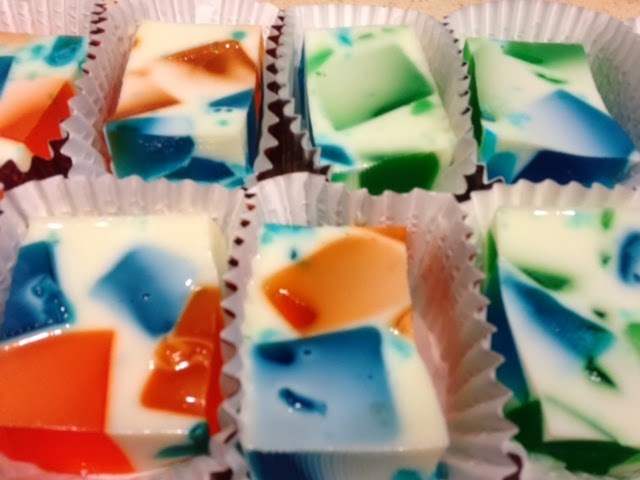 The photo below shows the broken glass jello dessert I made for the 2014 Super Bowl game day--team colors for the Denver Broncos and the Seattle Sea Hawks! It was a favorite from fans from both teams! In separate bowls, dissolve each package of Jell-O in one cup of boiling water. Chill until set. In a large bowl, blend condensed milk, 1/2 can hot water and 1/2 can tap water. Stir to blend well. Mix 4 envelopes gelatin into 1 cup hot water. Stir well. Combine condensed milk into mixture. Set aside to cool. When Jell-O is firm, cut up into "broken glass" pieces and distribute evenly into 9x13" pan. Pour milk mixture into the pan. Chill until set. Cut into pieces and enjoy!